A builder was taken to the Emergency Department of Việt Nam – Germany Friendship Hospital last Tuesday in a critical condition after receiving an electronic shock while at work. The man had sustained severe burns to over half of his body. Bùi Minh Bình, of Thái Bình Province, took the builder to hospital. He said he had only just met the man a day earlier when they worked together on a construction site in Hà Nội’s Đống Đa District. Bình said he had moved from his hometown to Hà Nội to earn a living, Nhân Dân Cuối Tuần (The People Weekend) magazine reported. He sometimes worked as a builder and other times as a porter. Bình would take on almost any work as long as it was legal. “I just thought of going to the capital to earn a living, I never considered the dangers I could face working here,” Bình said. Bình admitted he worked at the construction site without protective equipment. Not only Bình and the builder who was electrocuted, but many labourers nationwide are in the same situation. They work without protective equipment and are liable to suffer a workplace accident at any time. For example, four workers were killed and three others injured in June 2016, in the central province of Nghệ An’s Hạ Sơn Commune. The workers were hired to install a telecommunication pole in the commune, however, the pole made contact with a live electric cable. The workers, without protective equipment, received deadly electric shocks. Earlier this year, three people were killed and three others injured in a workplace accident on Nam Từ Liêm District’s Tố Hữu Street. In May, another accident killed three people and injured four others at a construction site in the northern province of Hải Dương’s Kinh Môn District. More recently, two workers died and another was injured in an accident in the Central Highlands’ Đà Lạt Province. The common theme to these workplace accidents was that victims were manual labourers, working without protective equipment and social insurance cards. Statistics from the Việt Nam – Germany Hospital showed that the hospital received 1,138 patients due to workplace accidents in the first six months of this year. This means that 200 victims of workplace accidents are being hospitalised each month. A report from the Labour Safety Department under the Ministry of Labour, Invalids and Social Affairs pointed out that nearly 9,000 workplace accidents occurred nationwide last year, killing 928 people and injuring 1,915 others. This was nearly 1,000 more cases than in 2016. Just 2,600 workplace accident reportedly occurred each year during the period 1995-2005 and 6,000 during the period of 2006-16. 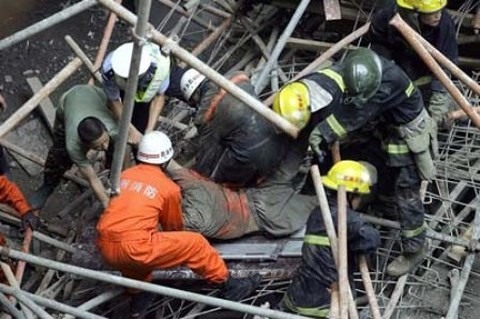 Nguyễn Tiến Tùng, chief inspector of the ministry said the real number of workplace accidents was thought to be much higher than the reports suggest. Tùng said employers often found ways to satisfy victims’ families after a workplace accident occurred to keep the case secret. Thus, statistics by authorised agencies might be incorrect. According to experts, employers that do not hold training courses for their workers were to blame for the situation. Other reasons were that employers did not periodically check machinery and equipment to ensure the safety of labourers, or they failed to provide protective equipment at all. The poor management of employers in supervising construction sites also added to the issue. Additionally, labourers themselves neglected their safety while at work, experts said. Tùng, chief inspector of the ministry added that pre-warning employers before inspecting labour safety as per regulations was partly to blame. In response, Nguyễn Anh Thơ, deputy director of the ministry’s Labour Safety Department said the department is launching a range of activities in an attempt to improve the situation this year. The activities include organising dialogues with employers and forums on labour safety for labourers, as well as training courses on labour safety for both employers and workers in all localities, he said. Further, authorised agencies would tighten control over areas with a high risk of workplace accidents, such as construction or mining sites. Deputy Minister Lê Tấn Dũng said the ministry planned to fix shortcomings of the Labour Law so that it conforms with Labour Convention 81. If the shortcomings were fixed, inspectors would not give pre-warnings to employers before an inspection of labour safety. Then, the real number of workplace accidents would be revealed, he said. Dũng also said the ministry would raise the level of administrative fines for violations on labour safety so that employers were forced to obey the rules. Hùng, from the hospital, said at a construction or mining site, employers should arrange for two medical staff to promptly give first aid to victims in an emergency./.